France has submitted to Russia proposals regarding termination of the contract for the delivery of two Mistral-class helicopter carriers, Kommersant wrote on Friday, referring to sources in the field of military-technological cooperation. 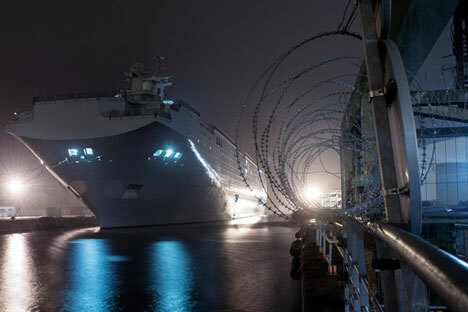 France has submitted to Russia proposals regarding termination of the contract for the delivery of two Mistral-class helicopter carriers, Kommersant wrote on May 15, referring to sources in the field of military-technological cooperation. "The House of Government, the Russian Defense Ministry and every department and organization involved in the Mistral project are studying the draft documents," a source told Kommersant. The newspaper's sources familiar with the proposals said that the size of the refund was the core of the negotiations. France declared its readiness to pay 784.6 million euros in compensation for Russia's "expenses and losses", but the Russian Defense Ministry disagreed and assessed "expenses and losses" incurred by "Russian organizations" in the construction and maintenance of helicopter carriers at 1.163 billion euros, the newspaper said. Sources told Kommersant that France was hoping to pay back the sums stated in work acceptance certificates and Russia intended to demand both the upfront payment of 892.9 million euros and the funds spent on crew coaching, construction of helicopter carrier infrastructures in Vladivostok and creation of Kamov Ka-52K seaborne helicopters. "We are absolutely not content with the return of the sum mentioned by the French offer, and Deputy Prime Minister Dmitry Rogozin has said so to Louis Gautier, Secretary General of the French General Secretariat for Defense and National Security, who is entitled to hold the negotiations. They are preparing their arguments," a source told Kommersant. According to the newspaper, France has proposed to share 50/50 the risks and expenses related to the dismantling and unloading of Russian equipment from their ships delivered during the construction process and the equipment's return to Russia. In the opinion Moscow, the expenses should be borne by DCNS because the contract termination is initiated by France. The draft document on termination of the contract also has a clause according to which DCNS will not pay back the money to the customer until Rosoboronexport and the Russian government give formal written permissions to sell both ships "to any interested third party without any provisos," the sources told Kommersant. They said the clause would be definitely revised with due account of Russian interests as "the French Defense Ministry had issued end-user certificates to the sterns built for DCNS by the Baltiysky Zavod shipyards. The Russian Defense Ministry is holding them [the certificates] and re-exports are impossible without Russian consent." Besides, DCNS claims that the contract will be terminated under force majeure circumstances. Yet "insurmountable circumstances" are not the reason why the Russian and French governments have agreed to suspend their cooperation in shipbuilding, the sources told Kommersant. The problem may be resolved under the French civil code established under Napoleon I on March 21, 1804 (the Napoleonic Code). Consistent with this code, the Russian government is entitled to repurchase rights: the French will buy out the ship (repay the money spent by Russia), and Russia will have the right to set any final price without justifying its structure. The Russian Defense Ministry backs this option, the newspaper said. There is still time for an official declaration of force majeure circumstances by France: the contract provides for this possibility until May 25, Kommersant said.